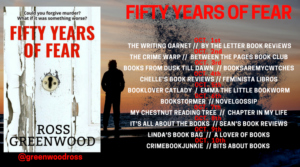 Thrilled to be hosting the final stop (along with tour organiser, Caroline of Bits About Books) Ross Greenwood’s Fifty Years of Fear. My thanks to the author for an ARC of this book and Caroline for inviting me to be on the tour! First let’s find out a bit about Ross Greenwood before I share my review!! I had the absolute pleasure of reading this book way back in the early stages as a beta reader, and let me tell you – it was a story that really had me questioning everything! The book opens in 1966 and we are taken through various decades as this story unfolds. Violence as a way of life, relationships, dysfunction, mental health, fear, loss, buried secrets, decisions/choices and a journey of discovery are the main themes that stuck out for me. The reader follows Vinnie as he tries to piece together his past and uncover a truth that made me wonder if it was better off buried …. what a story! 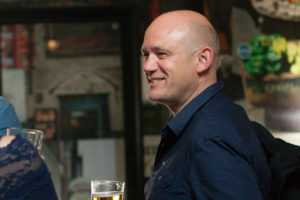 There is a steady build up of pace as the story unfolds – for me, it felt almost like a coming of age crossed with crime fiction…you know something is going to happen, you just don’t know when. There is a great narrative and the reader becomes entwined in this emotive story- the voice was strong and it made you listen! Tension and atmosphere were present and hung in the air like a thick mist – the reader is just pulled into this piece of fiction whether you want to or not! There are so many unique and interesting characters in this story – Vinnie being one. He is a complex and perhaps even a slightly unintentional unreliable narrator. What a journey he is on! He tries his best to be “the good son” in stark contrast to his brother, Frank – but just cannot do right. Frank is a bully and uses violence as a means to an end – but he is so protective of his brother – you have to admire that. And their mother – well jaysus …that is all I am going to say about that!! Vinnie’s wife played a poignant role in his life and some aspects of her story were just so tragic. There were definitely aspects of this story that I just wanted to know more about or expanded on a bit more, but it didn’t stop me from enjoying the book as a whole. In short, this is definitely a book I would recommend. It is not a thriller, but a book you need to sit back and absorb – each word, each page and each chapter. 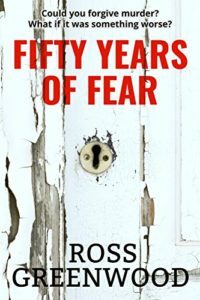 Captivating, complex and enthralling – grab a copy of Fifty Years of Fear now! You won’t regret it! This entry was posted in Blog Tours, Book Reviews and tagged #Crime #Twists #Murder, #CrimeFiction, #Suspense by crimebookjunkie. Bookmark the permalink.